Jack has returned to Blooview this morning with Grandma. Unfortunately, I came down with the stomach flu yesterday and have to now isolate myself from Jack for several days. So Jack slept at Grandma and Grandpa’s last night and Grandma will be staying with him at Bloorview until Wednesday evening. I miss him! Over the weekend, Jack mainly relaxed in front of the TV. He has taken a couple of steps on his own, but still requires a lot of assistance or his wheelchair to move around the house. His speech also still remains quite limited. So he still has a long ways to go, but is slowly progressing! Two thumbs up to leaving SickKids! What an incredible journey these past three weeks have been. On Thursday, Jack was transferred over to Bloorview Rehab Centre and has done well with the adjustment. So well in fact that they have let him come home for the weekend! I brought Jack home yesterday afternoon and he was thrilled to be home and rest in his own room with Christopher by his side. He will return to Bloorview Monday morning and stay Monday-Friday for the next 6-8 weeks. While there, he will go to school and have intensive speech, occupational and physical therapy. So today Jack and Christopher are watch “Alvin and the Chipmunks” together and next up is “Cloudy with a chance of meatballs”! It is so nice to have a bit of a sense of normalcy for a change! 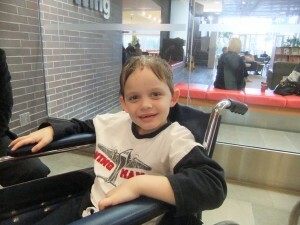 Jack is stable enough today to be transferred from Sickids over to Bloorview Macmillan Rehab Centre! We will be leaving this morning and Jack is excited about the car ride. Jack will be staying inpatient at the rehab centre for 6-8 weeks, but may be able to come home for the weekends! That would be amazing and it would be great for him to have some normalcy to his life. Please continue to pray for Jack’s recovery. He has taken several steps with assistance and I am so excited for the day when he can run down the hall. Off to pack and transfer the 100+ cards on his hospital room walls! 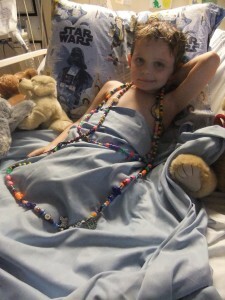 Today’s picture shows Jack wearing his “Bravery Beads” necklace. This is a program run by the hospital which allows children to accumulate a bead for every procedure, test, hospital stay, scan, therapy, or surgery they endure. You can see how many beads Jack has accumulated! It is shocking to me to reflect on how much Jack has gone through to earn these beads and makes me proud of Jack for the courage he demonstrates every day. Jack ate a little bit yesterday and cracked a couple of smiles. He’s making baby steps every day and the doctors are still confident he will make a full recovery with his speech and muscle weakness and it will simply take hard work over time to get there. 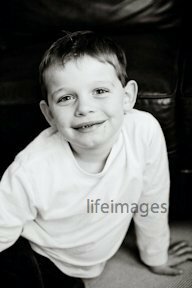 I would like to ask for prayers for Jack’s 3-yr-old brother Christopher today. He misses Jack a lot and has now told me several times that “Jack is never coming back”. He understands that the doctors are making Jack better, but he doesn’t understand the separation. It is also hard for him to not have me around and because he has a cold he has only seen Jack and I briefly over the past couple of weeks. We know that Christopher will be incredibly blessed to have a healthier brother return home, but for the next 6-8 weeks please pray that the time away from us isn’t too difficult. No seizures since last Monday! After bravely coping with thousands of seizures over the years, Jack has now been seizure-free for one week!!! 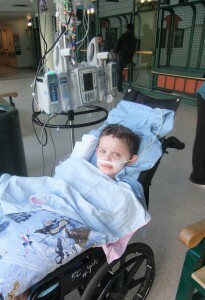 The seizures could return over the next days, weeks, or years but today we celebrate another healthy day for Jack!!!! Today’s picture is a baby photo of Jack taken on a plane trip to Florida. 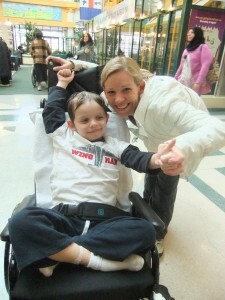 Throughout this time at SickKids, I’ve looked back on a lot of happy photos throughout his seven years and they always bring a smile to my face. Yesterday was a step forward again, which was wonderful to see. He was more alert and stayed awake for most of the morning. Jack still has his feeding tube in but was able to eat a bit of ice cream and three french fries. Jack was also moved to a reclining chair for a bit yesterday, which really tired him out as he can’t even hold his head up on his own yet. Rehab is hard work! Jack’s body has been through so much and he still has lots of drugs in him, so it will take a lot of determination on his part over the coming weeks to get up and around. I know he can do it and can’t wait for the day when he can run down the hallway here! The most exciting news though is that Jack has not had a single post-op seizure so far, which is incredible and hugely encouraging. 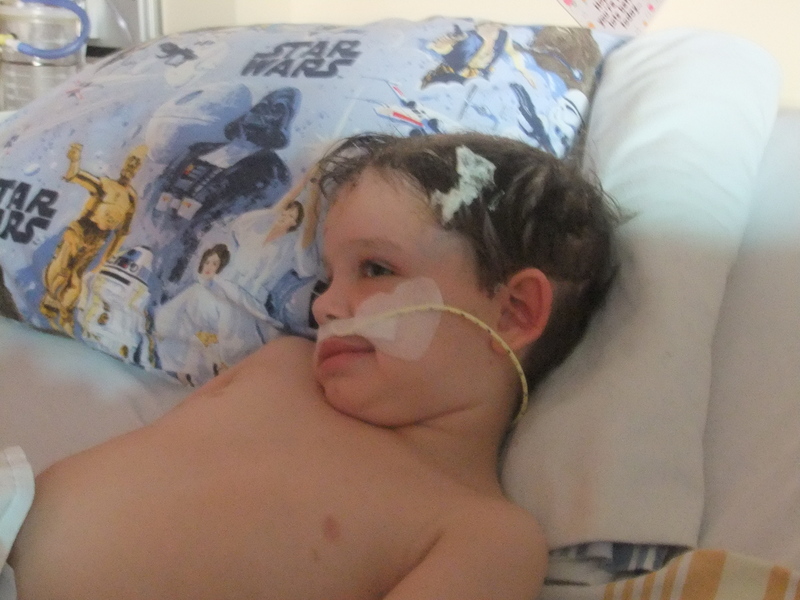 While it is still early days and he has a long ways to go, Jack’s brain has finally been able to rest from seizures since Monday – the first period of time in six years. 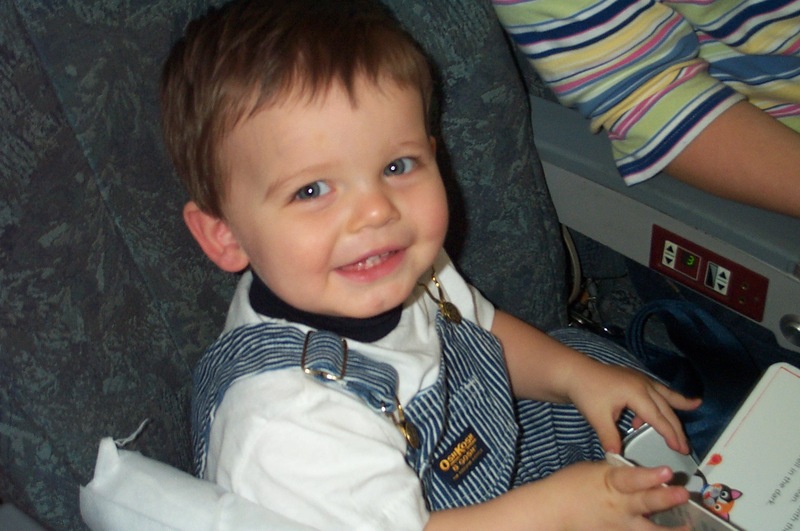 Prior to surgery, Jack had near constant seizure activity in his brain and his medical team described his left frontal lobe, the section that was removed, as “fried”. So there are no guarantees that the seizures won’t return, but for today we are hopeful and the possibility of Jack being cured is seeming more and more like a reality. Having lived with a heavy heart since his diagnosis and watching Jack bravely battle seizures every day for years, I can’t even comprehend the impact of a potential cure on Jack’s life and ours. It would be a dream come true. Yesterday turned out to be a rough day for Jack. He regressed in his recovery and spent most of the day sleeping and being fairly unresponsive, which was concerning to Jack’s medical team. The causes for this were investigated and a decision was made at 4pm to send him back in for another CT scan. With vivid flashbacks to last Wednesday’s emergency surgery due to bleeding in his brain, this was terrifying for us to say the least. The CT scan came back fine (thank goodness!) and his team said there could be a number of reasons contributing to his excessive drowsiness. At 4am this morning, Jack woke up and appeared more alert than he has been in the past 48 hours. He is reasonably awake again right now and just cracked his first smile since recovering from his first surgery while watching “Its a Bug’s Life”. So today’s picture is of that smile and I can’t tell you how joyous it is to see him smile for the first time again. Jack’s recovery and this whole surgical journey continues to be an incredible emotional roller coaster ride. Yesterday was a tough day with bumps in the road but I’m hopeful that today will be more positive and another step forward. The outpouring of love and support that we continue to receive makes a world of difference, encourages us and gives all of us strength! 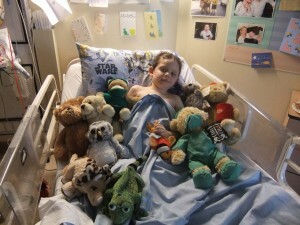 This picture was taken four weeks before surgery and is one of my favourite pictures of Jack. I have this photo posted on his hospital room door so that all of the doctors and nurses who enter see Jack as the smiling, happy, mischievous boy he is. We found out yesterday that Jack will likely be at SickKids for another week or two and then will likely be transferred over to be inpatient at Bloorview Macmillan Rehab Centre in Toronto for 6-8 weeks, where he will be part of their Acquired Brain Injury Rehab program. This program will involve a combination of speech, physical, and occupational therapy to maximize Jack’s post-surgery recovery. So it could still be a long time until Jack is able to return to Oakville, but every day things change around here, so Jack could end up being home sooner (or later) than anticipated. The goal is to have Jack sit up in a chair today and to begin eating, so that we can remove his feeding tube. His little body has been through so much that even sitting up will require tremendous effort. 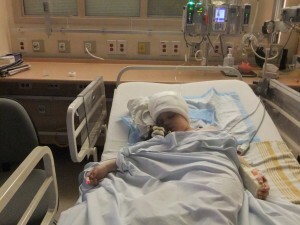 Please pray that Jack continues to be the amazingly strong little boy he is as he begins his long road to recovery. Jack rested comfortably throughout the night and is still on morphine, so he remains quite sleepy and groggy most of the time. When he does open his eyes, he continues to be able to talk and move his legs and arms – this is SO exciting and the doctors are very pleased with this too! Yesterday he developed a post-op fever, but it has now resolved. We were also told yesterday afternoon by the Infectious Disease team that a growth developed on a patch in Jack’s brain in between Jack’s surgeries. This is not concerning to Jack’s team, as the patch has now been removed, but will require a longer IV treatment of antibiotics for Jack. Today’s picture shows Jack and I hanging out in his bed. His room is so cheery and he has over 100 cards posted around his room! Thank you again to everyone for your amazing support! Jack is awake now and has just requested that I put on the TV, so I must run! Please keep praying for Jack to recover without a lot of pain and that he will soon be strong enough to start rehabilitation. 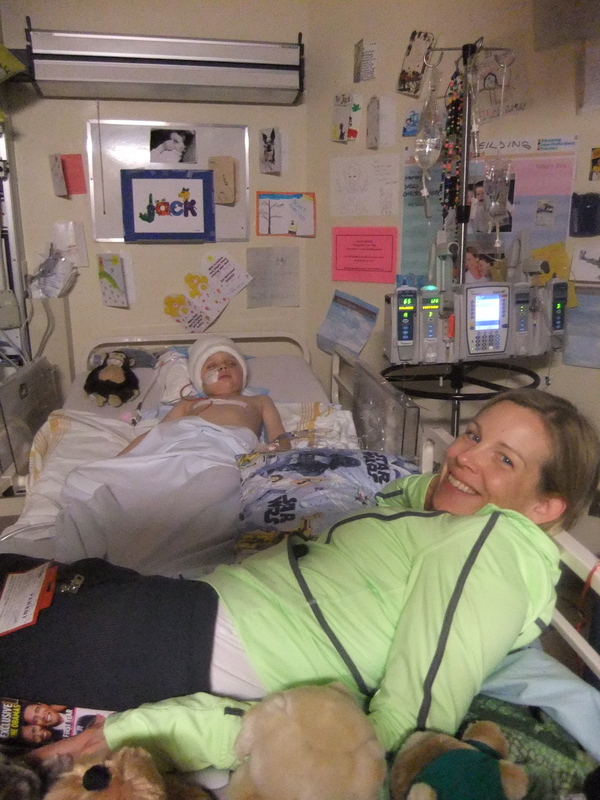 Jack rested comfortably in the ICU last night and has been moved back up to the Neurosurgery ward 5C. 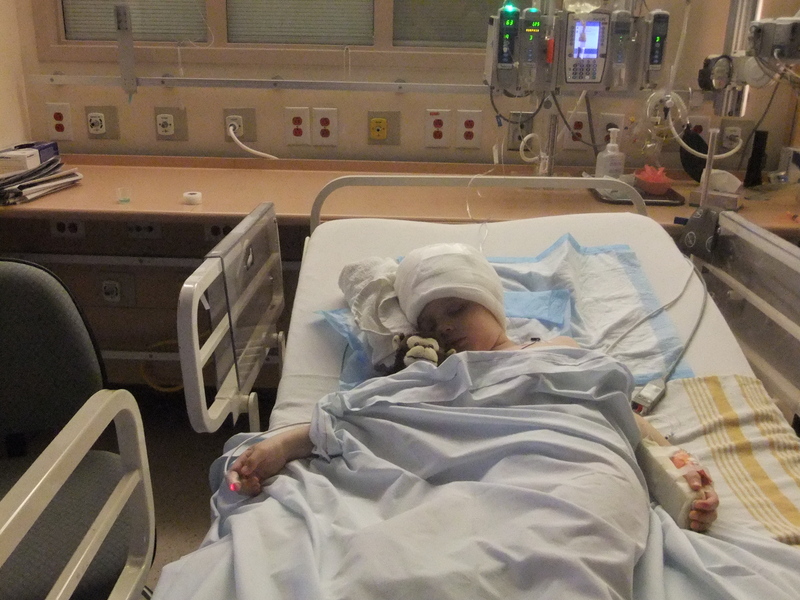 Today’s picture was taken in the ICU and shows him sleeping, with his stuffed monkey beside him. So, I am THRILLED to write that Jack said “I love you” to Dave last night and I was moved to tears this morning when in response to me asking Jack if he wanted me to hug him, he opened his eyes and reached up and hugged me with this right arm. There are no words to describe how this felt. I am feeling really positive, optimistic and hopeful that Jack will recover well from this surgery and that he will be able to play his DS within a couple of days! Please continue to pray that he rests comfortably today and that we continue to see no seizures as he recovers.